Everyone will know you are “in da’ house” when they hear your soul-drenched, scorching lead lines burn all over this up-tempo shuffle. Stevie Ray Vaughn, Albert King, Muddy Waters, Eric Clapton, BB King… (The list doesn’t stop), have created legendary music in this classic blues feel. The spotlight is on you and now it’s your turn to add your name to the legends. Besides the ever popular E minor pentatonic, you’ll find the E blues scale and various combinations of major pentatonic and Mixolydian scales soaring from many a legendary guitarists’ fingers. You woke up this mornin’? You’re baby left you for someone new? Then cry your heart out as you bend those notes on your Lucille over this classic slow blues. You’ll be in comfortable shoes standing with the likes of everyone from Albert King to ZZ Top as you pour your heart and soul out on this timeless progression with the E minor pentatonic scale. 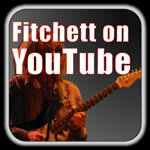 This is a great place to try your hand at the E blues scale, and various major pentatonic and Mixolydian scales as well. Put on your suit, hat and sunglasses, jump in your black ‘59 Cadillac, and head up to the South side of town with your brothers in blues. This swinging medium-tempo blues shuffle will make the folks in that nightclub feel good in their pain as you tear into one soul-drenched lick after another. So many greats, (Stevie Ray Vaughn, Albert King, Muddy Waters, Eric Clapton, BB King…the list doesn’t stop), have found a home in this traditional blues feel and now it’s finally your turn. Besides the ever popular E minor pentatonic, you’ll find the E blues scale and various combinations of major pentatonic and Mixolydian scales oozing from many a legendary guitarists’ fingers. When it’s time to party, nothing beats a simple straight ahead driving rock blues groove. Think Chuck Berry, and all of the artists he has influenced; The Rolling Stones, Bob Seger, Ted Nugent, Springsteen, Hendrix, need I say more? You can let the good times roll and be the life of the jam session when you bring out all of your classic Chuck Berry (duck walk anyone?) and Keith Richards moves on your axe. Besides the E minor pentatonic, you’ll find various combinations of the E blues, major pentatonic and Mixolydian scales will add to the party. You’re crying on the inside but this track makes you wanna dance. It’s a soulful minor blues stew; R&B with a dash of funk, and all you gotta do is just add some of your tasty licks to spice things up. What would Stevie or BB do? E minor pentatonic and the E blues scales should be served up as the main course. For the more adventurous palette, an order of Aeolian and Dorian minor scales on the side might just be the extra flavor needed to liven things up. Imagine your flowing guitar lines over this cool laid back minor swing jazz blues. It’s after midnight and everyone is mellow so you can lay back and leave some space. But as soon as you want to kick into high gear try some SRV or Hendrix over this track and watch everyone wake up. In this jazz blues you can always find a friend in the E minor pentatonic scale. To go a step beyond, a shot of Aeolian and Dorian minor scales washed down with a blues scale chaser may be antidote for over-indulging in the pentatonic. You are a bad a**d guitar slinger, ain’t nobody better mess with you when you start throwing down the hot licks and laying down the law of the blues on this country rock blues track. Besides the ever popular E minor pentatonic, you’ll find the E blues scale and various major pentatonic and Mixolydian scales will provide you with ample ammunition to run this town called bluesville. Go up town, wear sunglasses at night, and hang out with all the cool cats. Throw down some tasty down-home E minor pentatonic blues riffs on this jumpin’ jazz blues shuffle and show everyone your roots. But you know it won’t be long before the crowd knows you’ve moved to the big city when you start tearing into some slick jazz riffs. Blues has a new suit and it’s dressed to impress with the E blues scale, combined with various major pentatonic and Mixolydian scales. Lay down the funk and don’t shy away from the groove. Show some soul on this funk blues tune and watch your stinging guitar lines bring the audience to their feet. It’s OK to dance while you jam because everyone else will be. Besides the perennially favorite E minor pentatonic, you’ll find the E blues scale and various major pentatonic and Mixolydian scales will provide you with plenty of ideas to make this track groove.